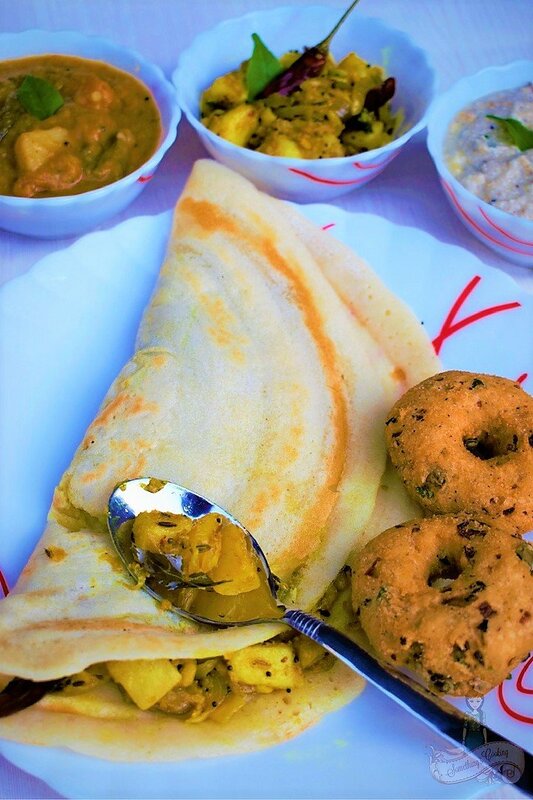 Masala Dosa is a popular breakfast dish from South India. It is a fermented crepe (dosa) stuffed with a mashed potato mixture with onion, green chilies, and spices. It is available across tiffin centers and restaurants. In my opinion, you’ll get the best ones in the vegetarian restaurant chains like the Udupi hotel, Arya Bhava, Arul Jyothi, Saravana Bhavan and also in the Indian Coffee House. 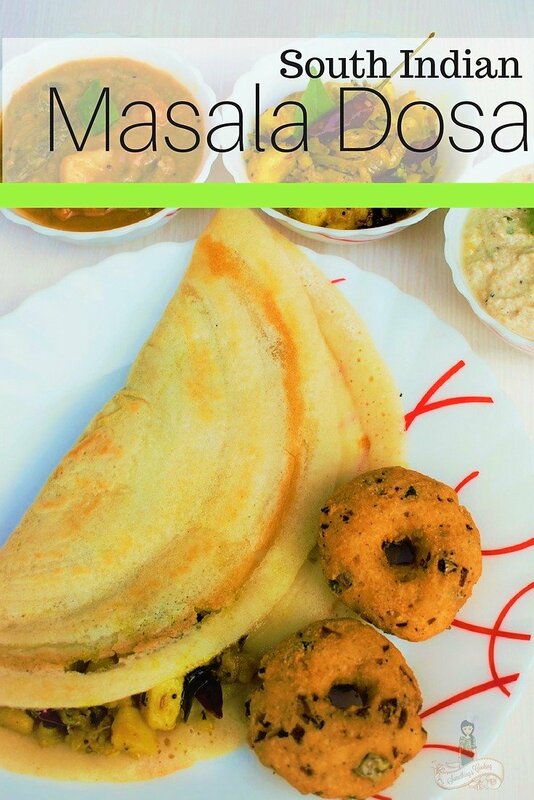 While I always loved Plain Dosa or Paper Roast, Masala Dosa has always been my sister’s favorite. 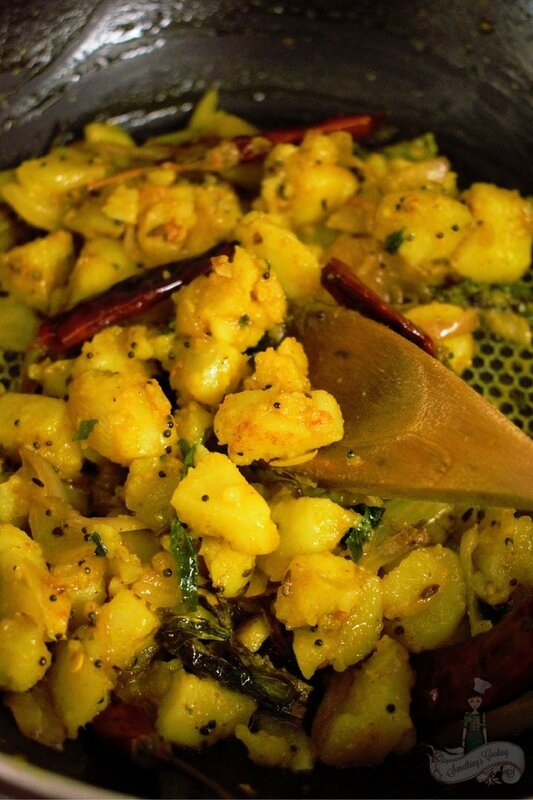 There was a time when I hated potatoes, and I just couldn’t bring myself to eat it, be it in a curry or fritters. But this versatile ingredient is my best friend now and I have begun incorporating it. Did you know that our humble Masala Dosa was featured in the list of Top Ten Foods to Try Before you Die by Huffington Post in 2012? It is featured among the Peking duck from China, Green Papaya Salad from Thailand, Seafood Laksa curry from Malaysia and BBQ ribs from the US. 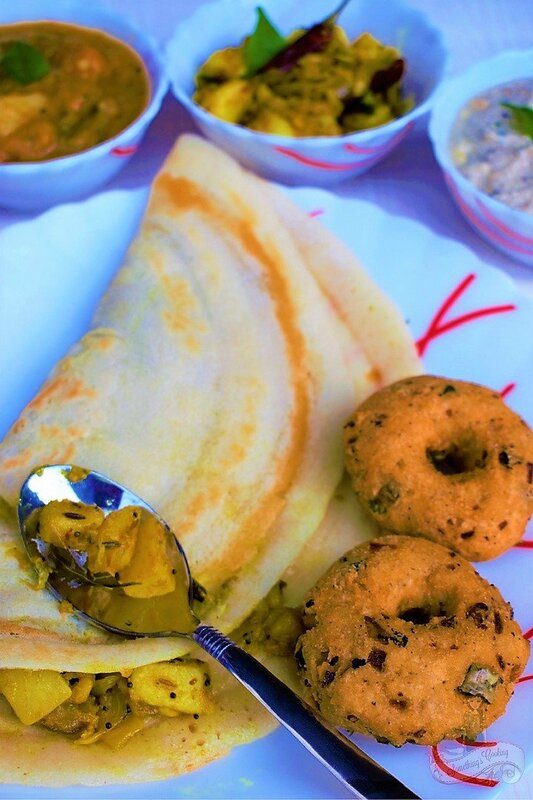 Masala Dosas are paper-thin fermented crepes made from rice and lentils. The batter is spread on a hot griddle and is cooked to lacy perfection. 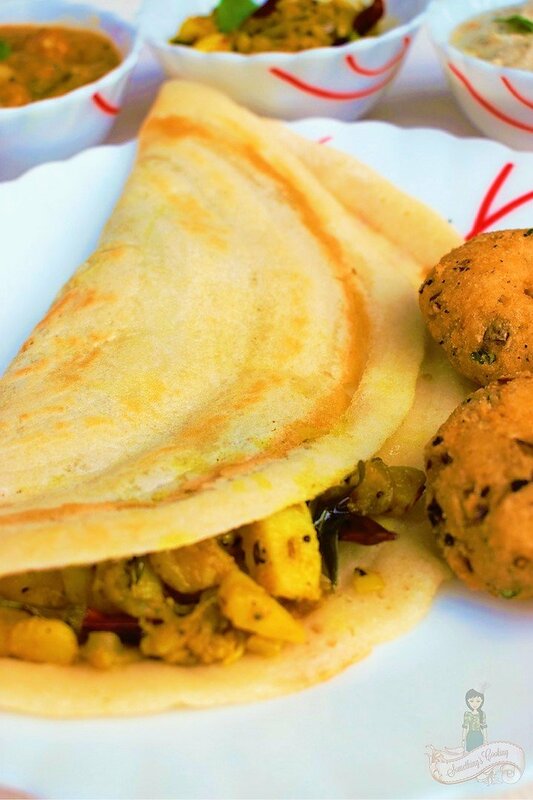 Without the potato stuffing, the dosa is called Plain Dosa. Wash and soak separately the rice, lentils, and fenugreek seeds overnight. Grind together the rice, Bengal gram, ginger, and curry leaves with little water, until you get a fine grain consistency. Remove. Grind Urad Dal and fenugreek seeds. Remove and add to the rice batter. Mix well with your hand for about five minutes. This helps in equal distribution and mixing of the ingredients. It also makes the batter airy. Leave it for at least 8 hours or overnight for fermentation. The batter will ferment well only in warm temperature. Add salt before preparing Dosa. Adding Chana Dal gives the Dosa a nice golden color. Adding some poha or flattened rice makes the Dosa crisp. and fenugreek Seeds helps the fermentation process. The batter should be loose and thin. Heat a pan and add oil. Add mustard seeds and cumin seeds. When it splutters, add dry red chilies,asafoetida, green chilies, curry leaves and onion. Add little salt and saute till onions are soft. Add crumbled potato and mix well. Cook for a couple of minutes, add water and mix again. Switch off the flame and keep aside. Before beginning the preparation, mix the batter well with little salt. Heat the Dosa tawa/pan.. Smear little oil, if you are using a cast-iron pan. Do not smear oil if you are using a non-stick pan. You will not be able to spread the batter then. In the middle of the pan, pour a ladle full of batter. Spread the batter in a circular motion, thus spreading the batter on the pan. Sprinkle little oil on the dosa and edges. Cook till it becomes golden and crisp. 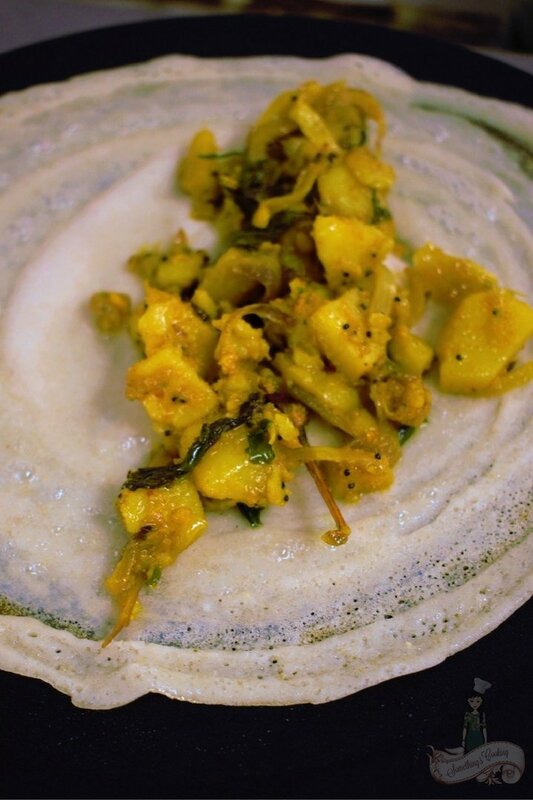 Keep about 2-3 tablespoon of cooked potato masala in the centre of dosa. Fold it into half. Serve hot with Sambar and Coconut Chutney. 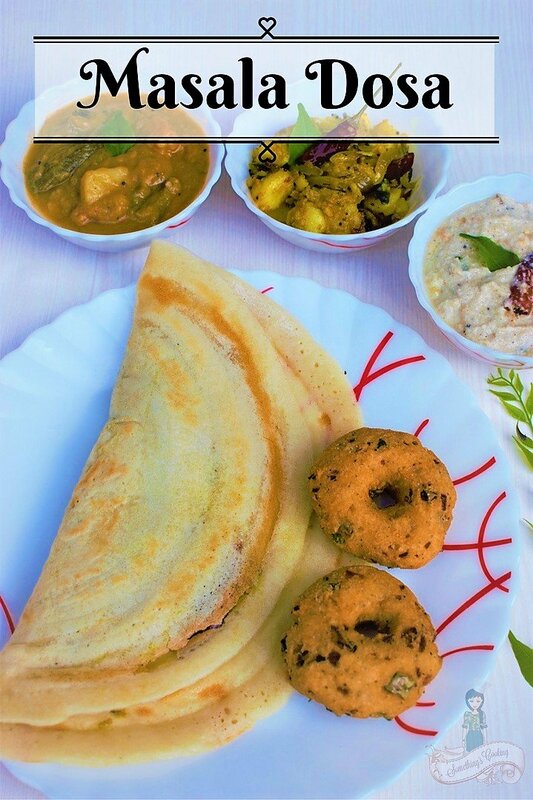 I love Masala dosa.Great that you shared a great recipe .Will try making it at home. AtoZChallenge is giving me so many recipes. I live in the US and do not have access to any Indian restaurants. Thank you for the recipe and the opportunity to make these. Masala dosa and idli are my favourites! Your pictures are drool worthy! I love Masala Dosa, Shalz! I love Dosa in any form. In fact have tried out making dosas with every possible lentil available. Thanks for the recipe!!! Bookmarked this. Shalu, do you add salt just before making the dosa or after mixing the batter, that is, before fermentation? How much water do you add to the grinder? You’re seriously making me miss food my mum makes! I get to eat dosa very rarely here as there are only a few south Indian restaurants…sigh! Your posts always leave me drooling and hungry. MMMM, now I’m craving these. Another scrumptious looking recipes, Shalini. You really do need to make a cookbook out of your blog posts. You put so much work and attention into them with great photos and instructions. They’re wonderful!